Cinzia Milani began to study classical guitar at a very young age and after private studies, graduated from the Conservatorio ‘A Boito’ in Parma at the age of 18. 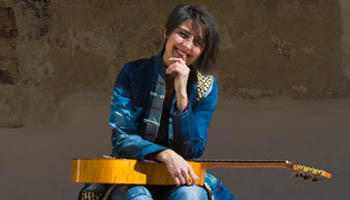 She has studied with many teachers and developed her guitar technique with the distinguished guitar master Mauro Storti, subsequently going on to study interpretative analysis with the Argentinian composer Oscar Roberto Casares. When Cinzia Milani was only 5 years old she won the international competition of Milan. Also, at the age of 7 she was awarded the ‘Ambrogino d’oro’ by the Municipality of Milan for her extraordinary and precocious musical ability and at the age of 10 she won the ‘Trofeo Beniamino Gigli’ in Recanati, was marked 100/100 points. In 1991 in Parma, Cinzia Milani was awarded the ‘Premio F. Margola’ for best execution and interpretation. By the age of 12, she began her concert career in Italy and went on to perform all over the world: United Kingdom, France, Spain, The United States, Canada, Mexico, South Africa, Indonesia, South America. By the age of 14 Cinzia Milani had already won sixteen first prizes in International and National Competitions. Cinzia Milani caught the attention of British and American press, which defined her as ‘a rare combination of beauty, grace, natural elegance…’ and as having ‘a deep sense of music with a brilliant technique and a powerful sound and expression, considered among the best exponents of the concert artists in the world….’ Cinzia Milani has already amassed an impressive discography: in addition to recording for Rai Radio 2 and Antenna 3, in 1994 she collaborated with composer A. Prandi to catalogue previously unpublished music for the guitar. Meanwhile, tracks from her CD ‘Ritratto di Donna’, recorded for the Jump Musical Edition label, have been broadcasted on RAI in Italy as well as on French, German and Japanese national television stations and films. Cinzia has also performed as a guitarist, dancer, and singer in the Argentinian show called ‘Sonatango’ and later recorded a CD with the same name. Also, she recorded the CD “Guitar”, Amadeus Label, Italian music by Castelnuovo-Tedesco, Margola, Domeniconi, Prandi, and also pieces wrote for her by the composers Cacciola and Betta. She has performed around Canada and the United States and she has taught guitar masterclasses at Royal Conservatory of Toronto. She recently performed in Indonesia and was part of a jury at “Valerio International Guitar Festival”.